Ayurveda means ‘knowledge of life’ and it originated more than 4000 years ago, making it one of the oldest systems of wellbeing known to man. The philosophy behind this genius comes from India where monks searched for new ways of being healthy. Its aim? To treat people wholeheartedly and not merely by their symptoms. The Ayurvedic Diet offers a body of wisdom designed to help you achieve complete balance. Which is greatly believed to remedy disease and increase your lifespan by years! With balance, your body and mind will perform at their best while helping you lose weight, keep it off and ensure a better flow of energy. Fewer artificial foods, colourings and preservatives are the norm of the diet, but it’s also focused on seasonal eating and the consumption of specific foods which will help bring your body’s life energies into sync. ​The vital Ayurvedic energies are made up of three main body types or doshas - vata, pitta and kapha. Everyone's made up of all three energies, but there are always one or two doshas that dominate. Determine your dosha and start making positive changes in your life. To truly know which dosha you are (and which Ayurvedic diet you'll benefit most from), you’ll have to visit an Ayurvedic physician who will go through your history and determine your exact dosha. BUT don't worry - it’s still possible to get an idea! To help us demystify the ancient healing science of Ayurveda (and how to incorporate it's teachings) we’ve enlisted the help of Ayurvedic therapist, Sunita Passi. ​ But first, take this online questionnaire from Holistic Online to find out which dosha closely resembles you. This energy has qualities reflecting the elements of space and air – the wind which moves things! When Vata is balanced it is vibrant, enthusiastic and imaginative. When vata’s energy is displaced she may feel restless, anxious and at times lose weight as a result. Here is a guideline of what you should encourage and avoid. Note: Vata can often feel run down so try to sustain your energy throughout the day by eating small meals. Foods to eat: Go for dry or raw foods such as bread and omelette. Root vegetables cooked in sesame oil make a fab choice as a side for lunch or dinner. Grains and fresh produce such as, basmati rice, brown rice, avocado, carrots, cherries, dates, fresh fish, almond and basil all make ideal choices for keeping vata balanced. Foods to avoid: Dried grains, granola, broccoli, lettuce, raw onions, cranberries, dried fruits, ice cream, lentils and pork. Drink: Sip on spicy ginger or nutmeg to help aid digestion, but try to avoid caffeine, beer and hard alcohol wherever possible. The pitta dosha has qualities reflecting the elements of fire and water. When balanced she is articulate, courageous and sharp. But when out of sync she can often be irritable, demanding and suffer from skin problems such as acne. “Pitta individuals tend to have a tendency towards imbalance. When they become irritable and skip a meal, they have a strong metabolism and digestion so can easily get aggravated by spicy foods," says Sunita. It’s also important to try t​o eat regularly and substantially throughout your day. Make sure lunch is the main meal for the day and be sure to take breaks from work! As a rule of thumb try to avoid hot and spicy food and limit your intake of alcohol, black tea, meat, eggs and salt. Food to eat: Eat sweet fruits such as, red grapes or figs and avoid anything zesty or citrusy. Quinoa, mushrooms, okra, cottage cheese and cilantro will help balance pitta. As for bread, go for flatbread instead of regular yeasted kinds. Foods to avoid: Avoid aggravating foods such as mustard, hard yellow cheeses, red meats, tomatoes, buttermilk, shellfish and aubergine. Generally try to avoid salt or spices in excess as this can affect your energy. Drinks: Start juicing! Sunita recommends drinking plenty of green juices such as, parsley, celery or wheatgrass. But don't forget your H2O. Avoid excess caffeine and alcohol. Kapha dosha qualities reflect the elements of water and earth – the elements that stick! Kapha types tend to be a stronger build than most. Typically they have wide hips and shoulders and thick hair. When balanced Kapha is affectionate, compassionate and steady, but when imbalanced this energy can become lethargic, sluggish, possessive and can sometimes gain weight. Because Kapha tends to be of a larger build they can usually “miss a meal and are not hungry on waking up. They also have a slow metabolism and their digestive fire is often weak.” Says Sunita. To balance this individual through diet, follow a kapha-pacifying diet with freshly cooked, high-fibre foods. Avoid indulging in comfort foods such as sweets and treats when depressed or down and instead favour foods which are bitter, pungent and astringent in taste. In the AM kapha is generally able to skip breakfast with only a few pieces of fruits by mid morning. But in the evening, food should not be eaten after 7pm - make sure to eat lightly. Food to eat: Soups and light vegetables are best. Veg that's dark green and leafy make the best sides in a Kapha diet. (Vegetarian meals suit this energy well.) Apples and pears make a fantastic source of fibre while also remaining a light option for sugar. 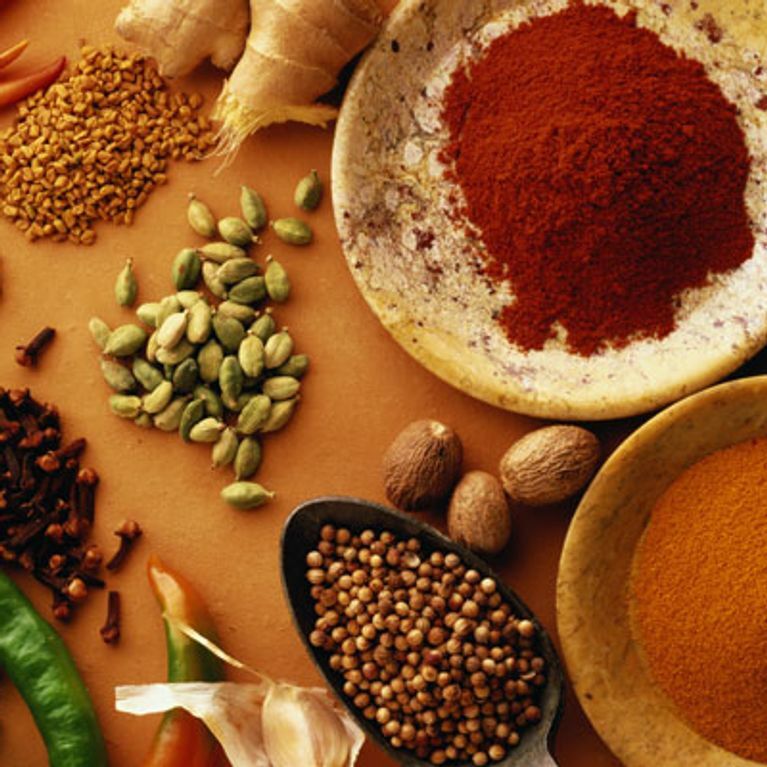 Favour hot and spicy foods which can help aid digestion and balance the metabolism. Foods to avoid: Avoid heavy foods such as pasta. breads, cakes and left overs. As well as beef and eggs, it's also ideal to stay away from most dairy products such as cheese, yoghurt and milk as this will help keep the digestive tract in good-working order. Drinks: Sip on water for cleansing and hot spicy drinks such as ginger or Chai.